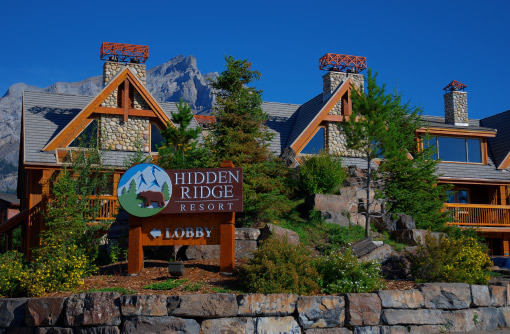 Hidden Ridge Resort has a great location, tucked away from the downtown area with some scenic views overlooking the town. This condo style property is popular for its full kitchens, larger units and wood burning fireplaces. 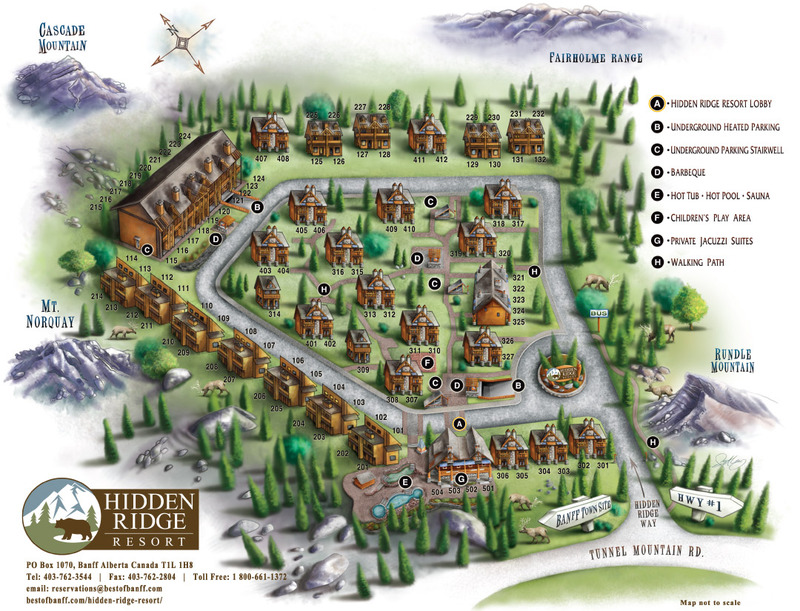 The Hidden Ridge Resort allows you to be on vacation but still offer many comforts from home. 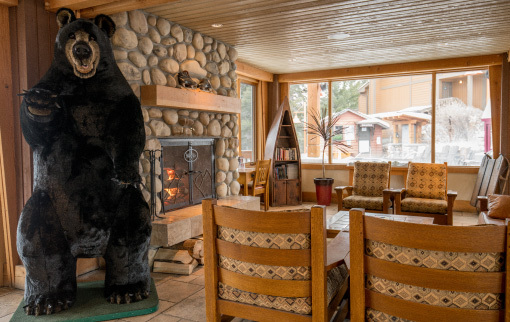 Be a true Canadian and BBQ year round, take a local paper from our lobby to see current events, or just enjoy a s’mores from the comfort of your wood burning fireplace in your condo. My family of 7 stayed comfortably in a 3 level condo consisting of a 4 queen bed, 2 full bath, full kitchen, washer dryer in the unit and a wood burning fireplace. You get all the free firewood you want! 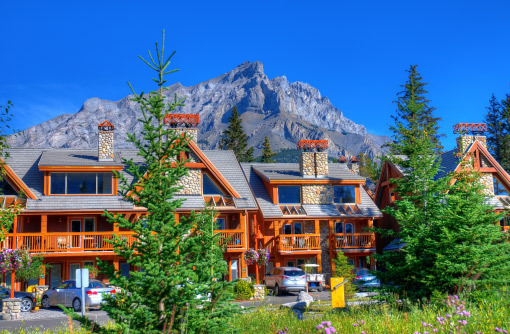 The property is located on Tunnel Ridge overlooking the cute town of Banff. It is a quick 1-2 minute drive into downtown Banff. The condo is functional and clean. Maid service is provided everyday with clean towels daily. My only complaint is that the kitchen is quite small. There is only room for the chef in the kitchen. 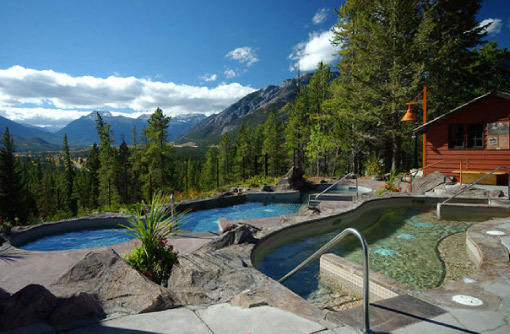 I absolutely loved the large hot pool and cool pool overlooking the Canadian Rockies. It is a few steps away from the condos. A beautiful large dry sauna is located next to the hot and cold pools. All the towels you need are provided right there, as well as a changing room and shower. It was a good price for the condo and amenities. I would stay there again. This place is the perfect combination of price, amenities, and location! Rooms are affordable, relatively spacious, and have some great amenities for the price—patio, fireplace (free matches, wood, and kindling), and a kitchenette with all you’ll need for basic cooking. The rooms are a little dated and show some wear & tear, but nothing major. It is located a few minutes uphill from town with plenty of parking, a bus stop nearby, or a sidewalk all the way up the hill. The rooms and patios have some decent views, as well. 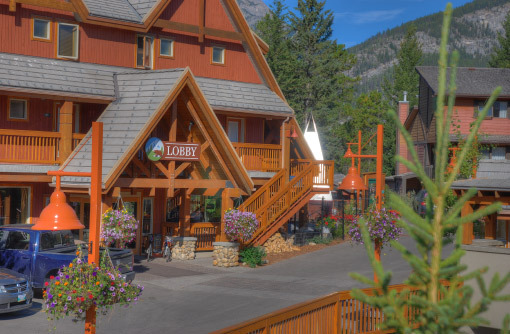 The resort also has laundry facilities, hot tub/pool, and free snow cleat/crampon rentals. They are really nice crampons, but one of the cables broke on mine at the end of my hike. The staff and manager were awesome with handling it. They were always super polite and friendly. We only stayed two nights but had a lovely room with open fireplace and a loft. Well equipped kitchenette – bus outside the resort with vouchers takes you straight into downtown Banff. Free firewood in plentiful supply and a ‘kindling kit’ was readily available from reception. 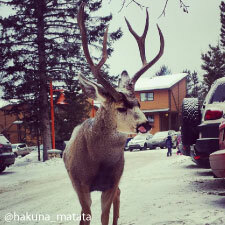 Resort staff are friendly and attentive. Most folks elected to park outside their rooms, but underground parking was warm, dry and readily available. There was so much space! The view of the mountains from our front patio was amazing. We found the loft to be reasonably clean and kept in good manner. 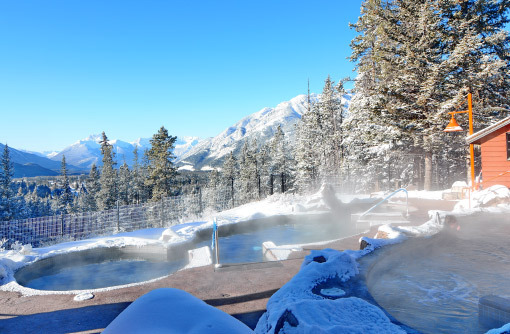 The hot pools were something out of a dream with amazing views of the snow topped mountains. There are bbq’s available for cooking, the transport bus to downtown Banff stopped directly in front of our room which was super convenient. The staff at the front desk were more than helpful and very welcoming. We can not wait to go back. This time for a longer stay. 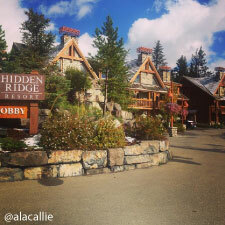 We’re loving our two week stay at Hidden Ridge Resort. 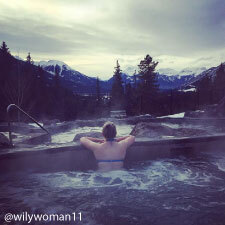 The views are lovely, staff very friendly and helpful and great hot tubs overlooking the Banff township, tunnel mountain, and Rockies beyond. Just gorgeous! Fireplace in our room so we make s’mores every evening. The front desk has the necessary supplies! Booked a condo-type, semi detached house split over 3 floors with 3 bedrooms, an open lounge, kitchen/diner and 2 bathrooms. Excellent value, clean, adequately serviced daily. 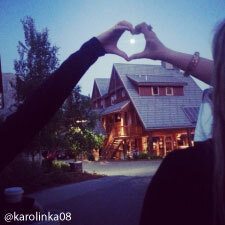 The resort has basic and necessary amenities, all kept to a good standard. Parking is underground or adjacent buildings. Staff were friendly, international and pretty quick if anything was necessary. All in all, a very good stay, which we’d happily repeat. Our recent 4 night stay was perfect! It is located just outside the townsite, so it is peaceful and quiet, away from all of the buzz. The condo was exactly what we needed, little kitchen and communal BBQ’s to allow us to make our own meals and an awesome communal hot tub to soak our tired muscles at the end of the day just steps away looking over the mountains/town site. The staff was awesome, giving us kindling right off the start to make our fires in our wood burning fireplace to burn off the evening chill and even gave us weiner sticks and marshmallows! Our room was made up daily which was always nice to come back to. 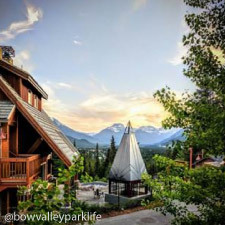 Overall, if you are looking for a quiet get away this is the place to do it…not exactly walking distance to the town but people did, we had a car rental so it was a matter of a 5 min drive to the heart of Banff. Will stay again for sure! We stayed here for 6 nights in March 2017. It is in an excellent location. 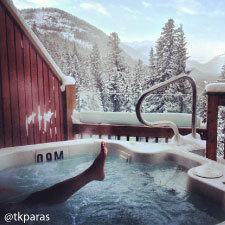 The outdoor hot tubs have great views of the mountains. Our room (2 bedrooms, 2 baths) was clean, the beds were comfortable and the place was quiet at night. We cooked in one night and the staff brought us a cookie sheet for pizza. There is washer and dryers at the main office, which was convenient. The staff was very professional and friendly. parking is easy. You can get kindling and fire wood for free from the staff – nice to build a fire after a day of skiing. I’d come back to this place! Great value! Staying here for 4 nights from Ireland. Beautiful quiet resort in Tunnel Mountain. Free bus pass into Banff so you can park the car and truly relax. Staff on reception are very friendly and the open fire is a lovely touch. Very clean and full kitchen facilities provided. I would highly recommend it.